House of Jen: That was so 1970! I finally got around to re doing the back entry. It has been on my "list" since October 2013, but just keep falling behind. I was really really dreading taking down the wall paper, but thanks to my new wallpaper steamer it was not the disaster I was dreading. I tried to find an actual before picture, but I realized I never took one, I guess I was trying to hide it. It was full of the same wallpaper that was in the kitchen, and that still lives on in the laundry room. The one on the right is the best I could find. 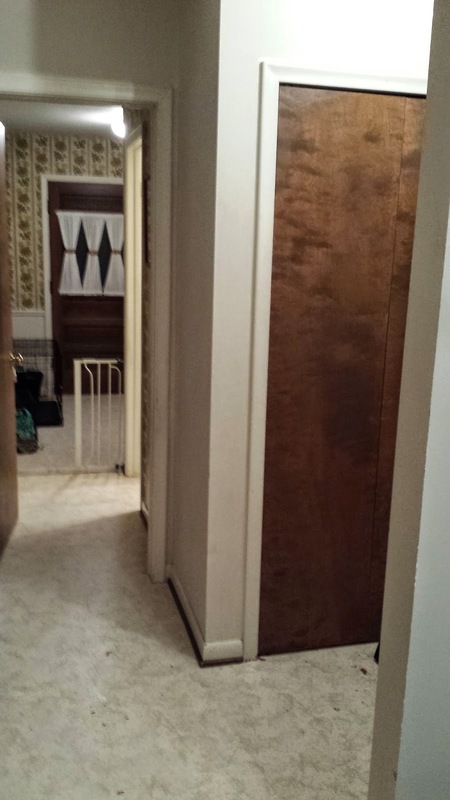 It took about 4 nights of 2 to 3 hour session to remove the wallpaper and all of the glue. 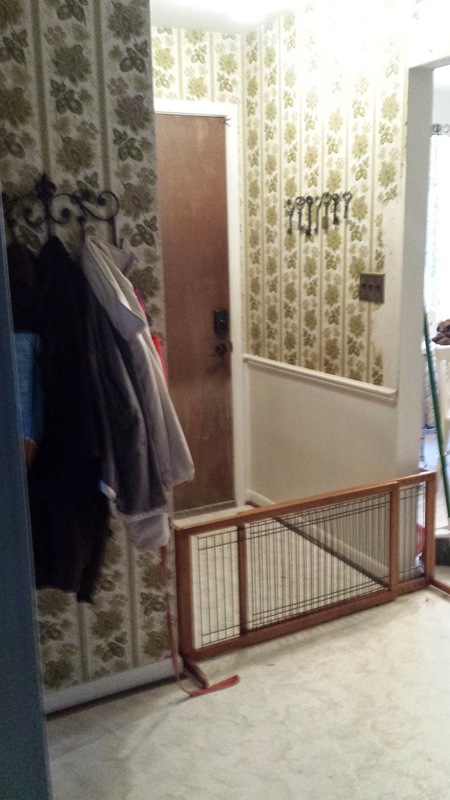 It must of been unpasted wallpaper so the glue had to be scraped off the walls too. You can see the laundry room in the background. For the time being I am planning on leaving the laundry room wallpaper as a little memento to the original owners. And because I really don't want to take down more wallpaper. 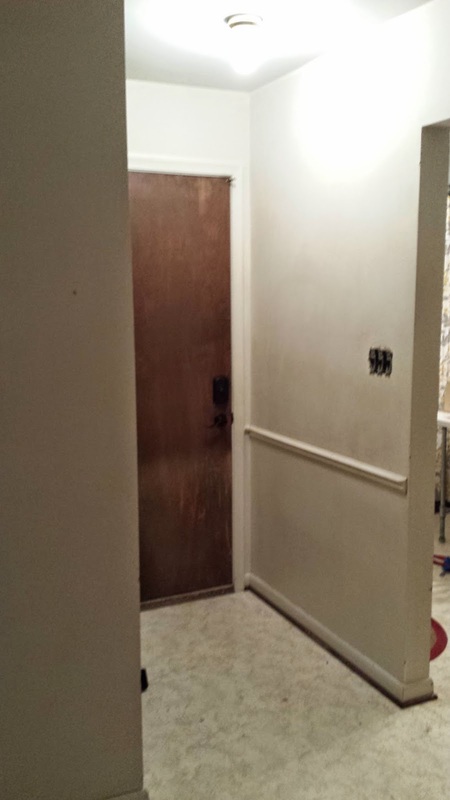 When we have the basement framed out next year I do plan on moving the laundry room door back behind the powder room. It really bugs me that guests have to go into the laundry room to use the bathroom. 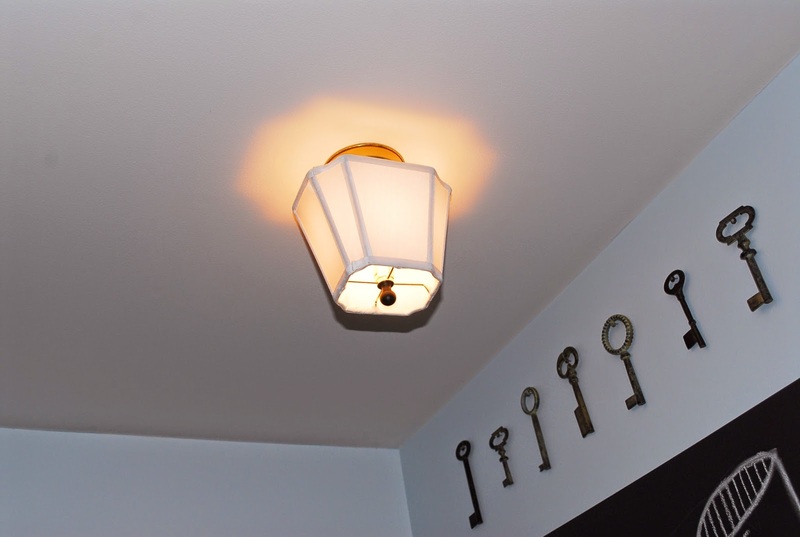 Here is my "free" light fixture makeover. It was one of those "old lady" frosted glass blubs so I had taken off the bulb and was going to try and find a clear open bottom glass shade and an Edison bulb, well first problem the opening was too wide for any of the glass shades at home depot, and problem two I broke the current glass blub on the way into home depot. So we did end up buying a new fixture, but I really didn't like it and figured I'd spend the money when I found something I really liked. I had an idea about a shade, so I went looking for one in my surprising large collection on lamp shades. I found the right size and color and it even had a bulb clip and everything! So its better than before and it was free! My next project is the doors. Right now the wood really stands out, and that is what they look like over the whole house. 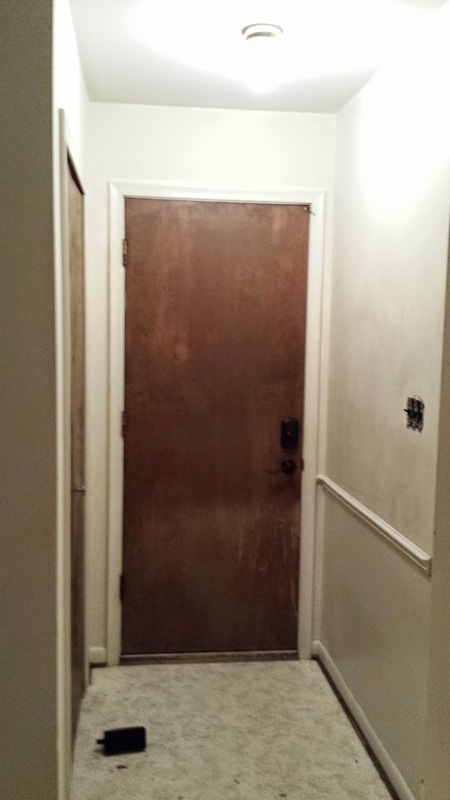 It's on the list to redo the doors, I want to either nail on trim or install new panel doors and paint them either black or white. 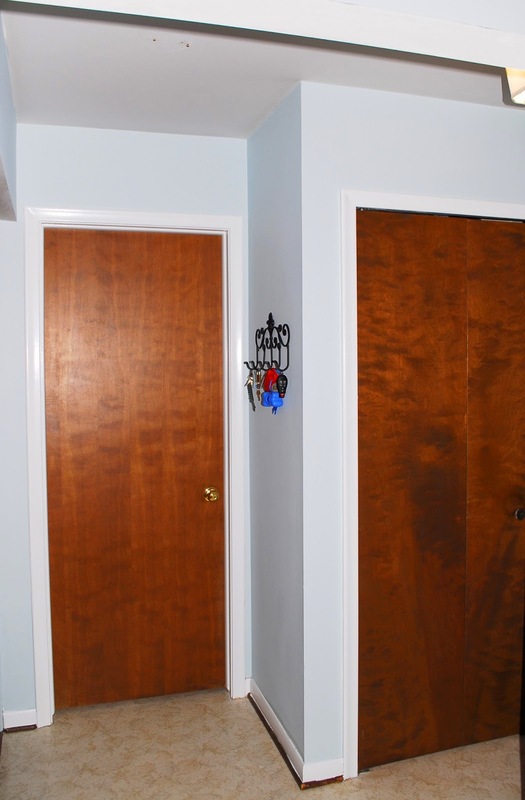 I was looking at slab doors and they are only like 25 to 30 bucks for new ones, and molding will cost over half that per door so if the sizes line up, I'm totally getting new doors. As for the color, lets get the doors up first. 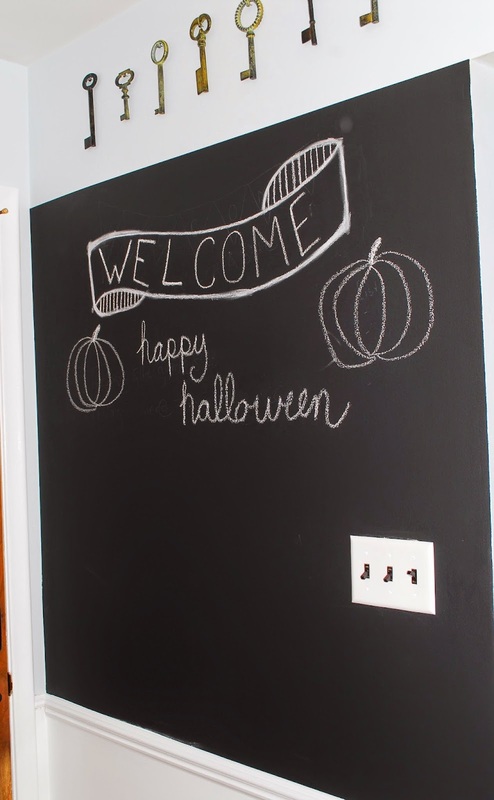 And a new chalkboard. This is my biggest one yet, who knows maybe next time I'll do a whole wall. I'm on a chalkboard kick. I like location as a welcome to the house. 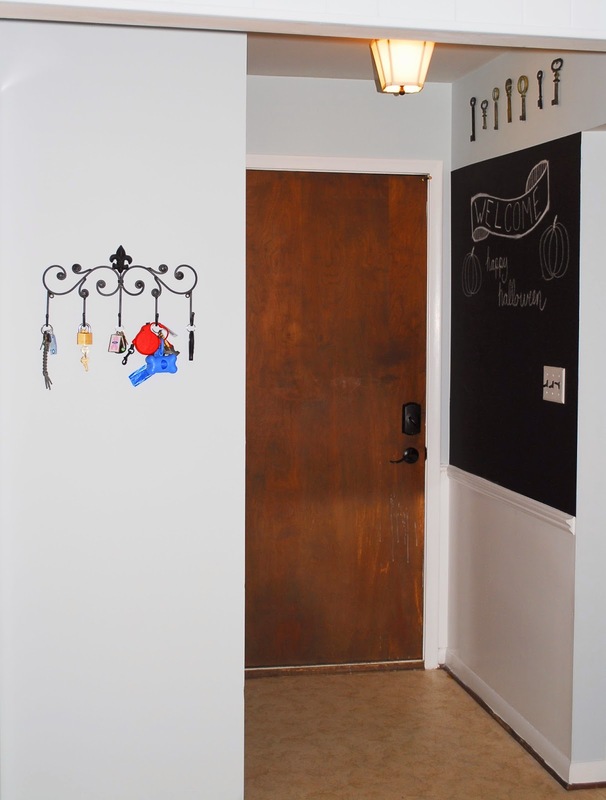 Most of our friends and family come to the back door so it gets a lot of traffic, plus I can change it with ever season to decorate! I have a post to do about different types of chalk, its more complex that you would think. I took these pictures at night so I plan to get some updated day time ones.